Popular American science fiction writer Ray Bradbury died in Southern California Tuesday night, he was 91. 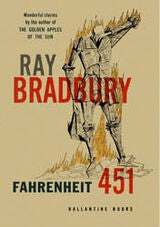 Bradbury was best known for his novels Farhenheit 451, Dandelion Wine, and Something Wicked This Way Comes, as well as his short story collection The Martian Chronicles. Bradbury's death was confirmed by his daughter Alexandra Bradbury, according to The New York Times. During his career, Bradbury was awarded the National Medal of Arts, the Medal for Distinguished Contribution to American Letters, and a star on the Hollywood Walk of Fame. Numerous Bradbury works have been adapted for television and film. In 2007, Bradbury received a special Pulitzer citation “for his distinguished, prolific, and deeply influential career.” Bradbury was born in Waukegan, Ill. on August 22, 1920 and published his first short story before he was 20 years old.